This is by far the worst way to introduce Rashida Jones. 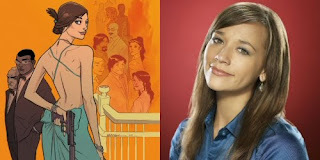 I first encountered the name Rashida Jones from her work on “Boston Public.” As I mentioned in a post a long long time ago, I was quite the routine “Boston Public” fan. And she was the voice of reason in “The Social Network.” No, Brenda Song was not the voice of reason. It was Rashida Jones. Brenda Song just gave blow jobs. And in news that is more exciting than Brenda Song’s mouth, Rashida Jones the actress-comic book writer has sold her rights to her comic book “Frenemy of the State," which chronicles a socialite that gives earns some Respect from the CIA. This is going to be huge. Like HUGE!!! Here is a link to her comic book info. Who still likes Boston Public? What do you think of Brenda Song’s mouth? is she a muslim? is she single?